This version of Aura is only for GameMaker Studio 2. For GM:S 1.4, please see here. 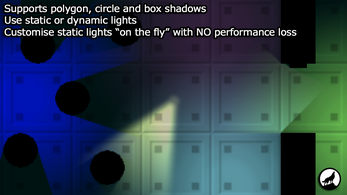 Aura is a surface-based, simple to use lighting engine for your 2D games. 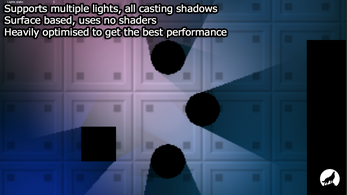 It's main feature is that it is easy to use and a no-fuss solution to the problem of creating lights and shadows in GameMaker. Version 2.0 offers numerous improvements over the original, and makes the most of the new GMS2 capabilities, making it more feature rich than ever! Why not see for yourself by checking out the Aura 2 Live Demo? Cross platform! Tested on UWP, Desktop, Mobile and HTML5! Shadows can be defined as box, circle or polygon shapes. 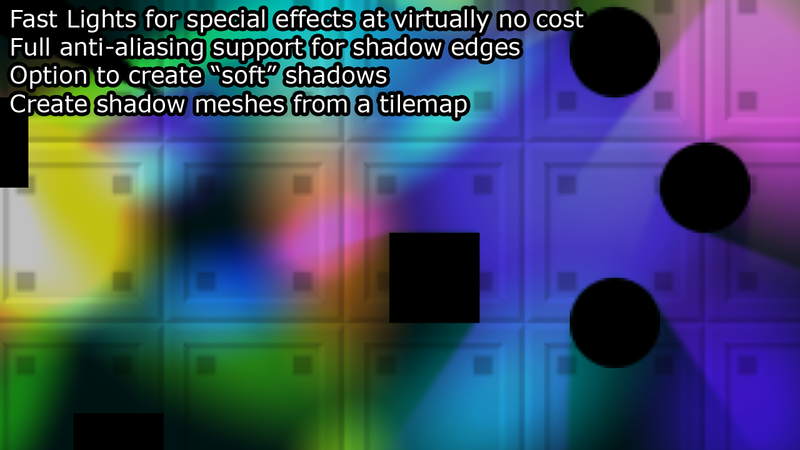 Polygon shadows can be created easily through a points list method and can be convex *or* concave. You can create a shadow mesh from a tilemap layer too! Lighting created with "Multiply" blending rather than "Additive" blending, giving super-natural effects, without any of the brightness and saturation associated with other lighting engines. Three demo rooms included for Dynamic Lights, Static Lights, and a General demo room where you can see how all the features work together.